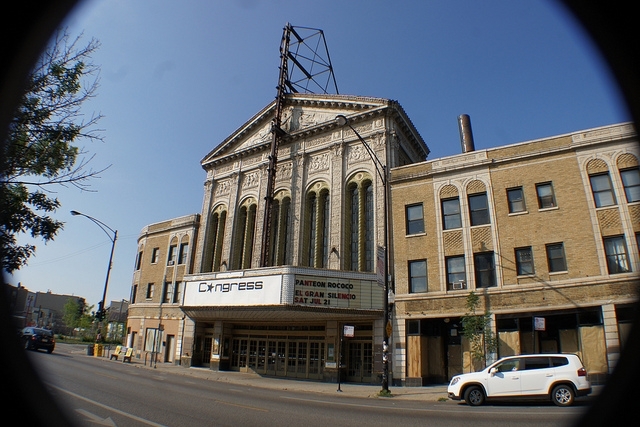 An inspection of the Congress Theater Monday found sufficient progress to remain open at least for the next few weeks. "The majority of the most serious violations are complied," according to Judy Frydland, the lawyer representing the city. Those violations include poor wiring, ventilation and obstructed exits, among other things. Last week Frydland told DNA Info Chicago that the Congress now has fire extinguishers and carbon monoxide detectors, improved wiring, and a functional fire curtain. It&apos;s not clear if ventilation issues have been addressed. "We&apos;re going to pursue this case until they&apos;re in compliance," Frydland said in court on Tuesday. Judge James McGing then ruled that the theater can continue selling tickets to upcioming shows as long as capacity on the main floor is capped at 3,000. The second and third floors of the 87-year-old venue have been closed since January and will remain blocked off to concert-goers until violations on those balconies are remedied. City agencies will hold another inspection the week of the next hearing on May 9. But the building violations are not the only problem that controversial venue owner Erineo "Eddie" Carranza faces. The next hearing in Liquor Commission proceedings that could cost Carranza his liquor license takes place a week from today, on Tuesday, April 30. And the next session of Deleterious Impact/Public Nuisance hearings against the theater take place on Tuesday, May 7, continuing the closer look that city officials and neighbors first initiated in March 2012. The controversy surrounding the theater continues to shock other Chicago venue owners and music promoters, whose memories are long. They maintain that if the city had been quicker to scrutinize the E2 nightclub and penalize existing building violations there, 21 people may not have died in a 2003 tragedy. "I can&apos;t understand how [Carranza] has stayed open as long as he has, or why the city lets him continue," said the owner of a venue a quarter of the size of the Congress. "I&apos;ve been hassled for much, much less, and you can&apos;t even complain, because it&apos;s about public safety." Another promoter questioned why the city was "raising a red flag so late in the game. We all know Eddie is negligent, but what about the city?" Added yet another live music insider: "That list of infractions at the Congress scares the s--t out of me." Alison Cuddy contributed to this report.